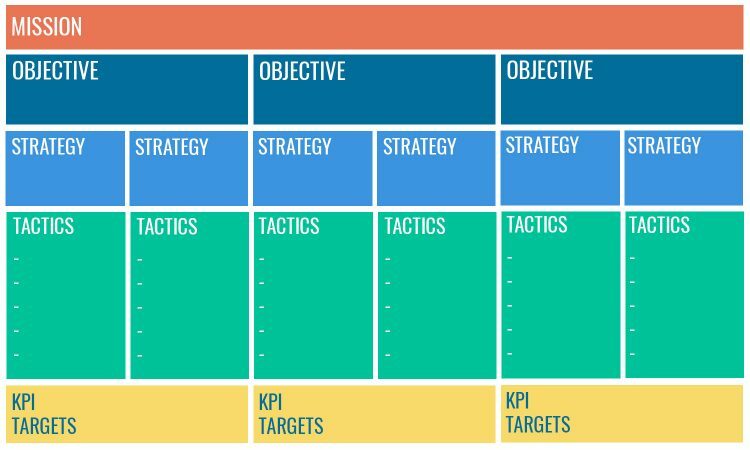 Before a company launches a marketing campaign, redesign, or any other project, online or off, the first step is to define a strategic plan. In theory, this plan then serves as a reference point to guide all the company’s actions going forward. As Avinash Kaushik heavily emphasizes, the reason marketing campaigns fail is often related to the lack of a clear strategic plan. Ok, but what exactly does that mean? Well, essentially it means identifying what your goals are and how you plan to achieve them, including the tactics and strategies you’ll use. I’ve noticed though, on a number of projects I’ve worked on, that people often get these concepts mixed up. What’s more, if each one isn’t spelled out in sufficiently concrete terms, the ideas can be difficult for internal teams to understand and use. As Graham Kenny points out in this excellent article, a strategic plan is sometimes confused with a list of goals – when in fact, it should be a reflection on what success means for the company or organization, and how they plan to optimize for that success. Work directly in the excel template! Share your email, we will send it over in the next few minutes. Google’s mission is to organize the world’s information and make it universally accessible and useful. And Facebook’s mission: to give people the power to share and make the world more open and connected. To illustrate each term, I’ll use the example of a humanitarian organization. It’s mission? To end hunger worldwide (not a bad mission!). When a company’s mission is well understood and properly integrated, it makes it easier to define objectives, strategies, and tactics in the long term. Your objectives determine what you want to achieve: increase market share, improve profitability, grow brand awareness in a particular region… Each objective needs to be measurable and time-bound. For example, in the case of our humanitarian organization, objectives might include increasing donations by 20% in one year, or maybe increasing community engagement through social media by 10%. Be concrete: If an army’s objective was to “win” well, that would be great. But it wouldn’t do much to help them figure out what steps to take to get there. Same thing goes for a home décor shop whose objective is to have a good 2015. It’s too vague to be effective, since a good year could mean completely different things from one boutique to another. Define your reference period: Your objective could be annual, monthly, quarterly… It doesn’t matter what the time frame is, but it needs to be time-bound, so you can verify whether you’ve met your objective. Make it measurable: For example, for the objective “increase market share” you would ideally add an order of magnitude – 10%, 20%, whatever – to allow you to decide whether the objective has been met, and to assess the effectiveness of your strategies over the course of the reference period. Be realistic: It’s all fine and well to be ambitious, but try to stay grounded. To keep yourself within the bounds of reality, I’d suggest analyzing your company’s past results, and doing some research into the norms for your industry to get a realistic idea of your potential for growth in your market. Each objective should have associated strategies: what approach(es) will you use to reach your objective? Remember the three types of media: Media that’s controlled by your company or organization, like your website (owned), attention your company gets as a result of something you’ve done, like having content shared on social media (earned), and media you pay for, like traditional advertising, or paid search (paid). Be consistent: Regardless of budget, having consistent strategies will help you reach your objective. For example, if your company is running paid search campaigns but you don’t optimize your site for organic search, it sends an inconsistent message to users. Think of your conversion funnel: Marketing efforts can be made at the top of the funnel (building awareness, approaching new markets…), in the middle of the funnel (lead generation), and at the end of the funnel (improving conversion rates). Analyze: Study past years successes, and review the best practices for your own industry and other industries that could have take-aways for your market. Prioritize: Based on objectives, based on budget, based on specific events in the coming year as well as in previous years, or even based on areas where your company has room for improvement (ex. improving retention if you already have a good visitor/audience base, but your engagement levels or conversion rates are low). Essentially, separate the things that must absolutely be done this year, from the things that would be nice to have, but aren’t urgent. Tactics are the tools, the actions, the operational aspect of strategy: what concrete action needs to be taken tomorrow, to reach our objective at the end of the year? Key performance indicators (KPIs) are used to measure your company’s progress towards its objectives. These are the metrics to watch, and they are what will ultimately let us know whether or not our strategic plan was effective. For example: Conversion rates, task completion rates, engagement rates. The target is the number you need to reach to achieve your objective. In my example, I included the target directly in the objective: 20% for the increase in donations, 10% for the growth in engagement. Think quality and efficiency: To quote Avinash Kaushik, choose “super awesome metrics.” Increasing traffic to your site is great, but what’s the point if you’re not attracting the right target audience? You’d be far better off using measuring your conversion rate, rather than number of site visits. Segment: Different markets have different levels of maturity. As a result, your KPIs might vary by segment. So, was all this more or less what you’d had in mind when you used these terms before?